Through our Venice Airport VIP Meet & Greet service we guide you through airport processes and ensure your arrival, transit or departure is as comfortable as possible. A member of our hospitality team will track arrivals and departures to make sure we won’t let you wait and will take care of you from the moment you arrive. Our company also provides a comprehensive, professional VIP service, including tours with highly-trained and discreet guides. Blitz Exclusive is authorised to carry out airport handling procedures by the Italian National Agency of Civil Aviation (ENAC). This service is organised in every detail in collaboration with airport authorities. Your flight is constantly monitored by our office to be sure we are there on your arrival. Our team consists of qualified, trained and multilingual professionals who are easily recognisable by their elegant uniform. 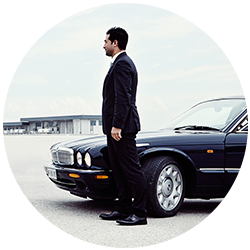 For Blitz you are the priority and we give you access to the VIP lounge, with transfers from or to your aircraft with a private Jaguar Daimler sedan.